Joel Goldsmith is a fascinating figure in New Thought, one I have written about before. Growing up in a Jewish home in New York, Goldsmith became a Christian Science healer as a young man, having witnessed his own father's miracle cure at the hands of Christian Scentists. He would quite quickly, however, break away to establish his own school named, after his bestselling book, The Infinite Way. His books definitely lie at the more mystical end of New Thought teaching, and Goldsmith and his followers seem to have been always aligned more closely to Christian Science than to the more free-wheeling milieu of New Thought. Indeed, much of his philosophy seems to me to be almost entirely a re-iteration of Mary Baker Eddy's teachings, though with a slightly less dogmatic spin, and a more willing and enthusiastic nod towards the richness and validity of other relgious traditions. 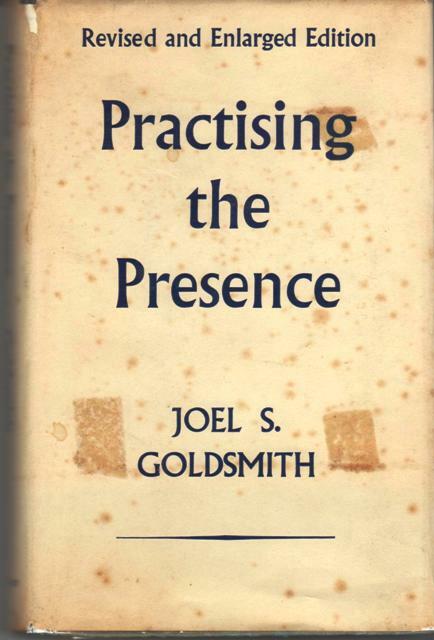 After The Infinite Way, Practising the Presence is Goldsmith's most popular and frequently cited work. As the title would suggest, it deals very much with the same territory as that great Catholic mystical classic The Practice of the Presence of God. Oddly, Goldsmith never mentions it. 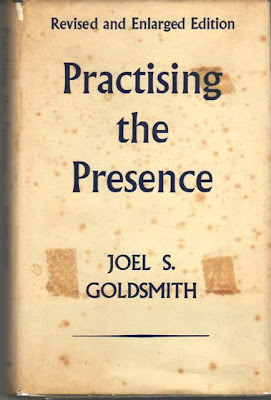 Like all of Goldsmith's work, Practising the Presence is a meditative, poetic and brief text, dealing, in several small chapters, with the different ways the spiritual practitioner might be able to deepen her experience of the Christ within. It is actually quite beautifully written, its concise nature making it constantly inspirational and giving the reader pause to reflect on their own exercise of spiritual discipline - most specifically prayer and meditation. In fact, the practice of prayer and meditation take up two full chapters, and is dealt with extensively in the others. A note on the title: I read a 1958 edition published in England, and it is spelled "Practising" - later US editions seem to spell it "Practicing." This is the eternal England/US practise/practice controversy that I still haven't quite got my head around, but I felt I should mention it for the sake of any spelling nazis lurking amongst my readership. "I am not concerned with whether anybody is grateful or anybody is loving or anybody is just. I renounce all that. I look for love, justice, recognition, reward, and compensation in, of, and from God." So we should not look without for solutions or satisfactions. The ultimate satisfaction lies with God, who is within us at all times. This is, of course, enormously comforting in a religious sense, though people of a more political turn of mind could (and would) criticise such an attitude as a form of ideological escape, as a disengagement from the world's very real problems. It is hardly a charter for social justice. What it is, quite specifically and quite obviously, is a mystic's charter. Goldsmith himself was a supremely unwordly figure, and Practising the Presence frequently reads like the manifesto of a monk or saint. It says that the only relationship that will ever count in our lives is the one we have with God. Goldsmith was, in fact, a popular religious figure in his day, and was famously followed by Doris Day and other celebrities in the 50s. The book sets out to be little more than a devotional guide, a collection of moral musings on the technology of prayer and the necessity of turning everything over to Christ. It is still in print, though the Christian rhetoric would probably be difficult for most 21st century readers to cope with. Stripped of its Christian jargon I suspect it would read very much like Eckhart Tolle's The Power of Now, which it constantly reminded me of. "Secrecy and sacredness go hand in hand." But do they, really? It is an odd motif that I notice repeated throughout the literature. Goldsmith tells us it is better to pray in private, and to be circumspect in sharing our spiritual realisations with others - mostly because he insists that people need to reach their own conclusions, and so can never be forced along the path of progress. The overriding message of the book is, to the seasoned reader of New Thought, not a radical one. We are possessed of a Divine energy which we need establish a reasonably constant contact with, and this contact is most efficiently made in prayer and meditation. I totally agree with Anna. Joel said that there are many people that could study his writing for years and years and still not get it. And then there are others who take to it like a duck to water (not his words about the duck). I don't mean to denigrate the reviewer of this book, but that's the feeling I got. The stated fact that Joel Goldmith in his association with Christian Science did "quite quickly break away to establish his own school...." doesn't ring true in light of the fact that Goldsmith was a Christian Science practitioner for 16 years and only after all that time then left to establish his own practice and write and lecture around the world. For me, Joel Goldsmith is the most inspirational mystic and metaphyscian I've run across since I was raised in Christian Science. He literally healed thousands of people from a vast array of diseases and conditions. He said Jesus wasn't kidding when he said "The kingdom of God is within you" and "go and do likewise - heal the sick, raise the dead..." "and greater things shall ye do." It requires attaining Christ consciousness and for Joel it was a 24/7 necessity. There are subtle (if you see them as subtle) differences between the two teachings and Joel says not to mix them. I understand why he says that to some degree but I still mix them, along with A Course in Miracles.